a) that what you're delivering matches what your store copy description says you're delivering. b) And so they can test the purchase and download behavior of the app. This issue must be published in Publish. You can always update the MIB file later. Annual subscription for $[price], issues delivered [frequency, e.g. monthly or weekly]. Single copy issues for $[price]. Payment will be charged to your AppStore account. Account will be charged for $[subscription price] renewal within 24-hours prior to the end of the current period. Any unused portion of a free trial period, if offered, will be forfeited when the user purchases a subscription. Do not link to online sales of your publication. If you have a link anywhere in your app (say, the Live window) that will take a user to a page on your site where they can buy a digital subscription, Apple will reject your app. 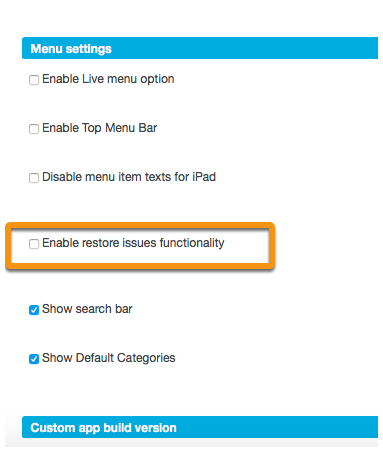 Do not enable restore purchase option if your publication does not have any in-app purchase. If you enable it the apple might wants to see your in app purchase products, which you might be restoring. Find the steps to enable/diasble.